The purest, creamiest frozen yogurt featuring live & active cultures that are low in fat, high in calcium with more than 40 toppings available. "Menchie's opens August 29, 2009. 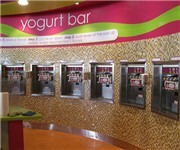 Located in Highland Park Village next to Who's Who Burgers, Menchie's is a self-serve frozen yogurt store. The yogurt" - Marisa M.
How Would You Rate Menchies Frozen Yogurt?